Rare books at fair prices... Asia - China & Japan. 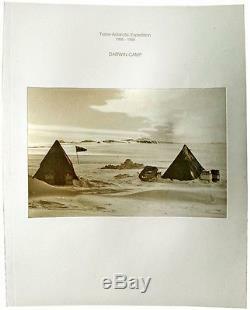 Large Antarctic Expedition Photograph Darwin Camp New Zealand Party 1956. 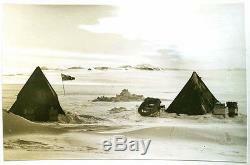 Striking original photograph taken in the Antarctic between 1956 and 1958, by a small group of explorers en route for the South Pole, showing two tents, a sled, minimal supplies, and the New Zealand flag, at a field camp erected by the New Zealand Darwin Party of the Commonwealth Trans-Antarctic Expedition - the third expedition ever to make a successful overland journey to the Pole Mounted on cardstock captioned in typescript Photograph measures approximately 12,5 x 9 cm 8vo. Cardstock leaf measures approximately 29 x 23 cm Very good condition Suitable for framing. The Skelton and Darwin Glacier routes to the Polar Plateau were pioneered by the New Zealand parties of this Antarctic Expedition. The routes began along the Hillary Coast, a section of coastline south of Ross Island and north of the Shackleton Coast, which in 1961 were named by the New Zealand Geographic Board after Sir Edmund Hillary, leader of the New Zealand Party. It was the first expedition to reach the South Pole overland in 46 years, preceded only by Amundsen's and Scott's respective parties in 1911 and 1912. In keeping with the tradition of polar expeditions of the'heroic age' the CTAE was a private venture, though it was supported by the governments of the United Kingdom, New Zealand, United States, Australia and South Africa, as well as many corporate and individual donations, under the patronage of Queen Elizabeth II. It was headed by British explorer Dr Vivian Fuchs, with New Zealander Sir Edmund Hillary leading the New Zealand Ross Sea Support team. The New Zealand party included scientists participating in International Geophysical Year (IGY) research while the UK IGY team were separately based at Halley Bay. Darwin Glacier is a large glacier flowing from the polar plateau eastward between the Darwin Mountains and the Cook Mountains to the Ross Ice Shelf. The lower part of the glacier was mapped by the British National Antarctic Expedition, 1901-04, and the whole area traversed by New Zealand parties of the Commonwealth Trans-Antarctic Expedition (1956-58). The glacier was named in association with the Darwin Mountains (themselves named after Leonard Darwin). The item "1956 ANTARCTIC EXPEDITION PHOTOGRAPH Darwin Glacier Camp New Zealand Party" is in sale since Sunday, March 27, 2016. This item is in the category "Collectibles\Photographic Images\Vintage & Antique (Pre-1940)\Magic Lantern Glass Slides". The seller is "voyagerpress" and is located in Blaine, Washington. This item can be shipped worldwide.